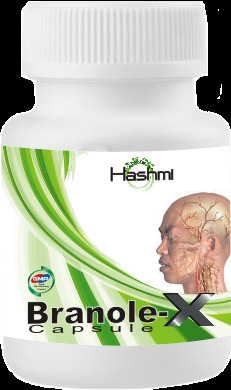 Hashmi Branole-X is a natural health supplement which keeps your mind sharp and focused all day long. It helps in slowing down the ageing process and prevents diseases such as dementia. It keeps your mind clear and well connected so that you can face the daily problems and tensions of life. Hashmi Branole-X is manufactured using a combination of natural herbs which is known to boost memory power and acts as an anti ageing agent which reverses the ageing process. This is an effective brain tonic which boosts brain cells to improve the functioning of the brain. It makes the brain active, improves learning power, increases concentration and soothes nerves. It is a natural brain product which forgetfulness and is totally safe without any kind of side effects. Hashmi Branole-X is known to boost memory power by several times and helps a person to stay active all day. It is a natural health supplement and is not addictive. It is popular worldwide because of its natural memory enhancing properties. Branole-X is a certified memory supplement product which also improves body defense and immunity mechanism. It enhances memory power, speech co-ordination and ability to speak. It is effective in repairing damaged cells and rejuvenates complete body.